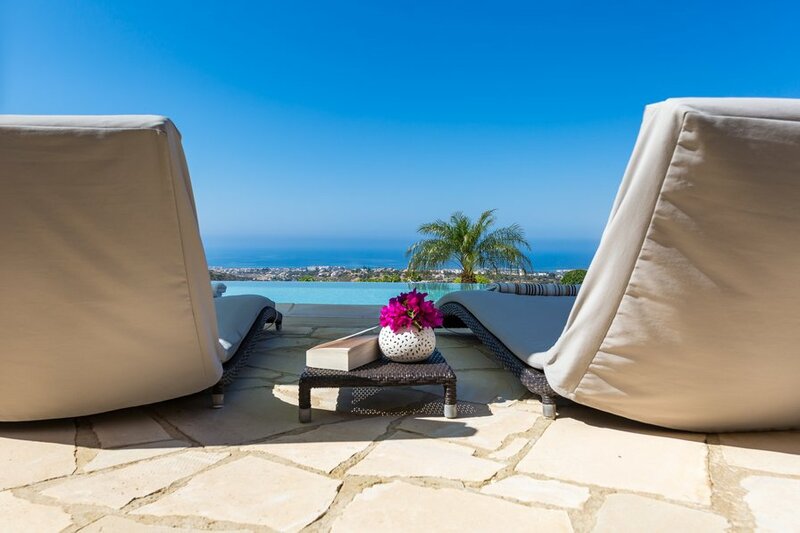 Villa Thission is a wonderful family villa with lots of luxurious private space and amazing panoramic sea views. It is a new villa, having been completed in 2009 and fitted out to a very high standard with new equipment throughout. The rooms in the villa are sunny and cool with white walls, tiled floors and simple and stylish furniture. Villa Thissions long lounge with full-height patio doors open out onto the pool-terrace. The lounge is equipped with sofas, 40" flat-screen TV, home cinema, Wii and PC + colour printer. The dining-kitchen area has lots of workspace and storage and is fitted out with new appliances. There are four lovely bedrooms - 2 double and 2 twin - and four accompanying bathrooms (en-suite for the double bedrooms). The two double bedrooms open out onto the pool-terrace which has amazing panoramic views of the Mediterranean Sea and hillsides. The garden and pool encompass the villa - a wonderfully relaxing and private space with a solar heated infinity-pool, sun-terraces, and a shady covered terrace with a barbecue. Villa Thission is just a 4-minute drive from Coral Bay itself with a long sandy beach, restaurants, cafes and shops. The traditional village of Pegeia is also close by - a 25-minute walk or short drive - with shops and traditional tavernas in the village. Ayrios Georgios, is only a 5 minute drive from Villa Thission. This picturesque fishing harbour is one of the islands best places to enjoy a seaside holiday. The fantastic sandy beach is popular with sunbathers and leads into a gloriously warm, clear sea. You can enjoy all sorts of seaside pastimes including snorkelling, safe bathing and even scuba diving. If that doesnt whet your appetite then the menus in the local fish tavernas certainly will. With amazing fresh local fish being hauled right into the harbour every day, the selection of fine seafood dishes is mouth watering. A fish mezze in one of the restaurants overlooking the ocean is a must! As well as the panomaric sea views you also have dramatic mountain range views to the side of the villa. Wii plus games available.